It doesn’t take a big budget to make a big difference in your home’s energy expenses and environmental impact. Full disclosure: The inspiration for this blog came from a well-written post by Derek Markham at Treehugger.com. As Markham points out, humans have an endless fascination with technology. Our passion for invention touches every aspect of our existence, enabling us to microwave complete meals in minutes, undertake robot-assisted surgery and perform countless other tasks faster, better and easier. How low can you go? 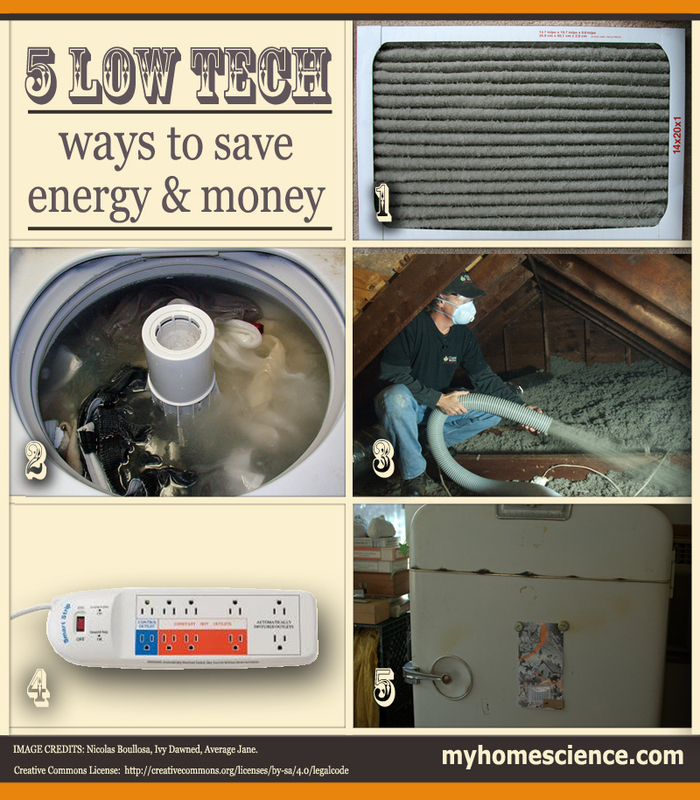 Try these low-tech ways to save energy. 1. Get the dust out. When was the last time your furnace filter was replaced? When this air filter gets dirty, it cuts down the efficiency of any forced-air heating or air conditioning system. Make sure to replace the filter at least once a season. It’s also smart to clean the coils in a heat pump at least once a year. The interior coil (located in the plenum of the air handler) can become clogged with dust, while the heat pump’s exterior coil can collect grass clippings, dust and insect debris. Coil cleaning can be done effectively using special coil brushes and coil cleaning sprays available a home centers. Removing dust and debris from the coil’s fine aluminum fins will help your heat pump function at peak efficiency. 2. Dial in the cold water wash. Water heating is the third-largest energy expense in most homes, accounting for around 15% of total home energy expenditures. You may not feel like taking cold showers to cut your energy bill, but most of your clothes probably can. Many of today’s ENERGY STAR® washing machines have cold water wash cycles designed for use with specially formulated cold water detergents. If you do a lot of laundry, switching to cold water wash will make a noticeable dent in your energy bill. Just make sure to use a good cold water detergent like Tide Coldwater, which earned high ratings in a recent Consumer Reports review. 3. Improve the attic. During cold weather, a huge amount of heat can rise by convection and escape into the attic because of air leakage and inadequate attic insulation. Correcting these two common deficiencies can cut your heating and cooling expenses by 30% or more, according to the U.S. Dept. of Energy. It will also make some of the chilly spots in your house a lot more comfortable. An attic insulation upgrade usually costs less than a new furnace, and it delivers hundreds of dollars of energy savings every year. Visit the Database of State Incentives for Renewables & Efficiency to see if rebates or other incentives are available in your area to make this green improvement even more attractive. 4. Switch off with certainty. You’ve probably heard about “phantom loads,” the electrical demands made by cell phone chargers, appliances with digital clocks, and electronic devices (like TVs and laser printers) that consume power in standby mode. Research has shown that as much as 10% of a home electricity bill can be attributed to what some people call “energy vampires.” A typical household has about 20 phantom loads, and they add an average of $200 to a home’s annual electrical bill. Eliminating phantom loads isn’t that difficult. You can start by always unplugging any battery charger when it’s not actually charging a device. Next, plug related components (like the TV, DVR box and speakers) into a single power strip that will cut power to all devices when you turn off the power strip. Before leaving the house, make a point to “kill” energy vampires so they can’t collectively sip on electricity while you’re out. 5. Retire the old fridge. Of course it’s convenient to keep an old refrigerator in the garage to gain some extra cooling capacity for beverages and food items. But old refrigerators are extremely inefficient compared to new ENERGY STAR® models. According to some sources, an outdated fridge can consume an extra $150-worth of electricity every year. The good news is that in many areas, utility companies or appliance recyclers will pick up your old fridge for free. OK, maybe you can’t take on all five of these energy-saving assignments. But at least one has got your name on it. Go low; it’s easy and rewarding.